Jonathan C. Brandt is a Certified Financial Planner™ professional and has been the owner of Journey Tree Financial Planning and Investments since 1993. Jonathan is a past president of the Financial Planning Association (FPA), Mid-Oregon Chapter. In addition to extensive professional reading, he attends numerous hours of financial planning and investment seminars per year. While providing financial planning management to his local clients, he has also shared his expertise across the state and in publications, including The Wall Street Journal. Jonathan has a Bachelor’s degree in Economics and Political Science from the University of Iowa. He has been active in a number of community organizations in Eugene since 1988, serving as president of the Eugene Gleemen, Willamette Repertory Theatre, and the Eugene Tree Foundation. He currently serves on the board of the John G. Shedd Institute for the Arts and is vice-president of the statewide board of Friends of Trees. As a Portfolio Manager at Journey Tree, Irina is responsible for investment analysis, portfolio allocation and evaluation, as well as monitoring of global economic developments and their impact on investments. She has over a decade of experience in the field of finance in various roles in both institutional investment consulting and corporate finance settings. Her background includes investment analysis and research, financial modeling, and qualitative and quantitative due diligence. 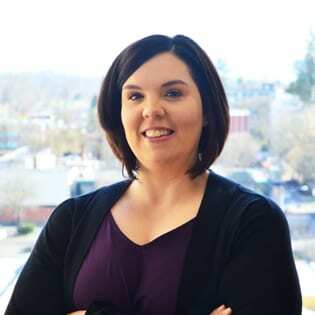 Irina earned her Bachelor of Business Administration degree from the University of Washington and a Master of Business Administration degree from the University of Oregon. Irina holds the Chartered Financial Analyst (CFA) designation and is a member of the CFA Society of Portland. Jennifer Paterson brings more than 15 years of administrative and customer service experience to work on the operational side of Journey Tree. Before joining the company, Jennifer worked for a diverse range of companies, including Lane Community College, AKS Engineering & Forestry, and The Home Depot. With her varied background in administrative support, customer service roles, and her love for learning, Jennifer has the perfect foundation for working in this position at Journey Tree. Michelle Erickson joins Journey Tree with more than a decade of experience in banking and financial planning. Michelle’s passion for problem-solving and educating clients makes her a great fit as a financial planner for our company. Michelle holds her Series 7 & Series 66 licenses. After moving from the East Coast in 1996, Michelle earned her Bachelor of Arts from the University of Oregon. In her free time, she enjoys traveling and all of the Pacific Northwest has to offer including dining out, wine tasting with friends, hiking, and rooting for the Oregon Ducks football team.